Objective of the study: Surgical staplers are used to perform several intestinal procedures including reconstructions and anastomoses with highly standardised techniques. However, postoperative bleeding, anastomotic dehiscence, or stenosis cannot be completely prevented. Considering the significant variations of tissue we analysed whether an optimised design of staples and staple lines can be defined, in particular looking for the impact of staple size, closure mechanism and the number of staple lines on the local compression of the surrounding tissue. 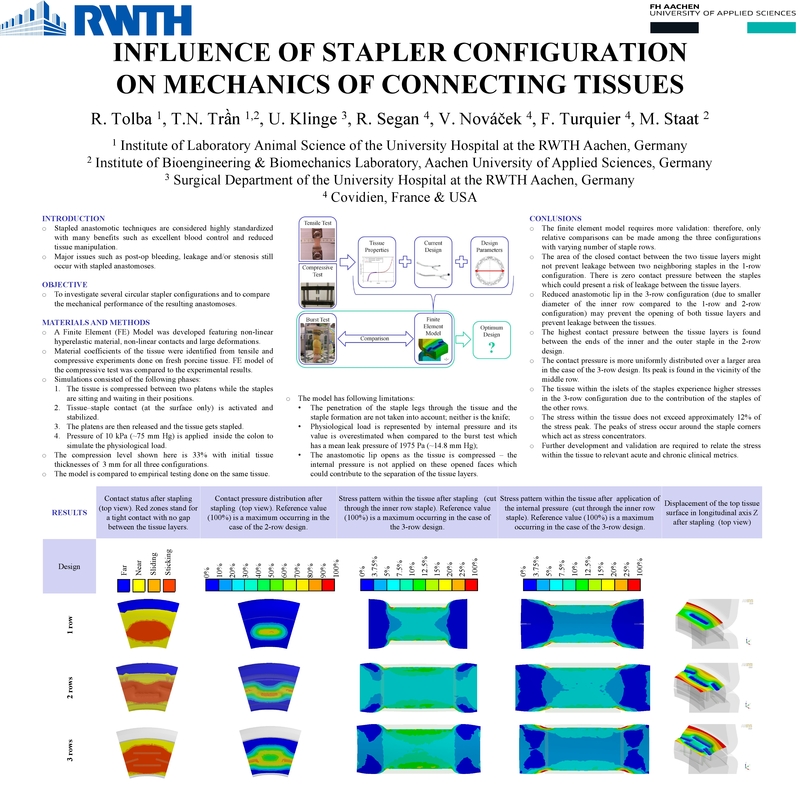 Methods and procedures: Computer simulations were performed by finite element analysis (FEA) (ANSYS) for two outcomes: tissue compression and global anastomosis performance for 5 models: DST Series EEA™ 25 mm as baseline configuration; 1 staple row with staple closed height of 1.5 mm; 2 staple rows with staple closed height of 1.5 mm; 3 rows staple closed height 1.5 mm; 2 staple rows with a staple closed height of 2 mm; 3 staple rows with staple closed height of 1.5 mm with different staple closed forms. Local equivalent stress to surrounding tissues and contact pressure were calculated. Under internal pressure, any loose contact between two tissue layers was regarded as leakage. Finally, FEA simulations were validated by experimental burst tests. Results: FEA enabled the assessment of local stress within the tissue. Inappropriate closing height of the staples or narrow staple line spacing increased the area of compression. The use of 3 staple lines resulted in less deformation at the anastomotic ring. Experimental measurements of the burst pressure in both jejunum and colon confirmed the improved anastomotic strength with three staple lines. Conclusions: Configuration of staples and staple lines strongly influenced the anastomosis integrity and tissue compression. Whether the high local compression in fact decreases blood supply will be verified in further in-vivo experiments. However, optimisation of staple geometry will help to improve wound healing and to reduce anastomotic complications.